Construction begins on Copenhagen-style cycle tracks in Montréal — Copenhagenize Design Co. The planned street design in the new Outremont campus development in Montréal (Ville de Montréal). 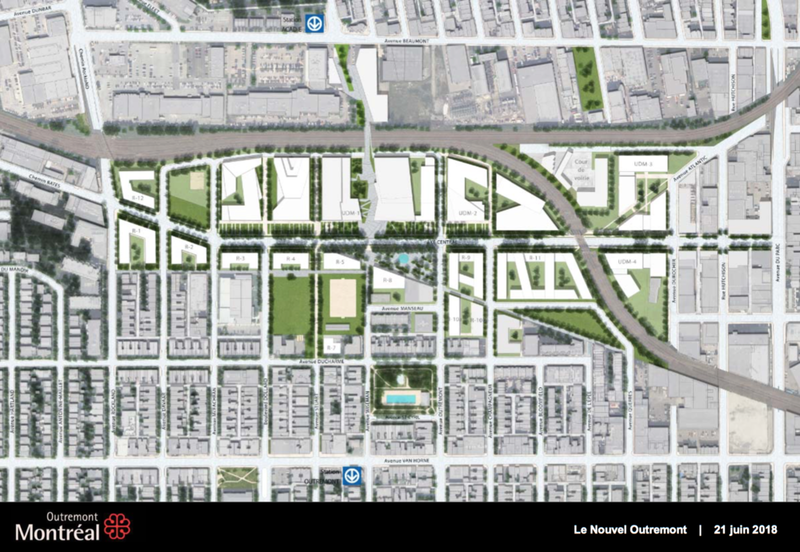 The Site Outremont is a high-profile capital development project, repurposing a former rail yard into a vibrant, mixed-use neighbourhood with over new 1,000 housing units, new streets and parks, and a new campus for the Université de Montréal. In 2017, Copenhagenize Design Co. was hired by the City of Montréal to assess the existing bicycle infrastructure and site conditions of all surrounding districts, and to propose improvements to the area in order to create a well-connected, comfortable, and safe bicycle network through this important new site. Recently, our Montréal team took a lunch-break walk to the new Site Outremont project in Montréal, where the new Université de Montréal campus neighbourhood is being erected. We were beyond excited to see that the City has begun construction on the Copenhagen-style cycle tracks our team recommended last fall. The Axe Central in the new campus will be fully equipped with a pair of curb-protected, one-way cycle tracks by summer 2019. The City of Montréal inspired by Copenhagenize Design Co.’s infrastructure recommendations (Ville de Montréal). The plan for a brand new neighbourhood linking a number of currently dis-connected communities (Ville de Montréal).